303 Berkeley (147 Beacon) is located on the SE corner of Beacon and Berkeley, with 126-128-130 Beacon to the north, across Beacon, 301 Berkeley to the south, across Alley 421, 145 Beacon to the east, and 149 Beacon to the west, across Berkeley. 303 Berkeley was built ca. 1861, originally numbered 147 Beacon until about 1906 when the front entrance was relocated to Berkeley Street. 147 Beacon was built for shipping merchant and real estate investor John Lowell Gardner along with two additional houses at 143–145 Beacon. John L. Gardner and his wife, Catharine Elizabeth (Peabody) Gardner, lived at 7 Beacon, and would build a new home at 182 Beacon in the mid-1860s. The land on which 143-145-147 Beacon were built was part of a larger parcel John L. Gardner had purchased on September 15, 1859, from William W. Goddard and T. Bigelow Lawrence. That parcel included the land on the south side of Beacon from Berkeley running east 114 feet. John L. Gardner sold the land to the east, where 139-141 Beacon would be built, and retained the land to the west for 143-145-147 Beacon. 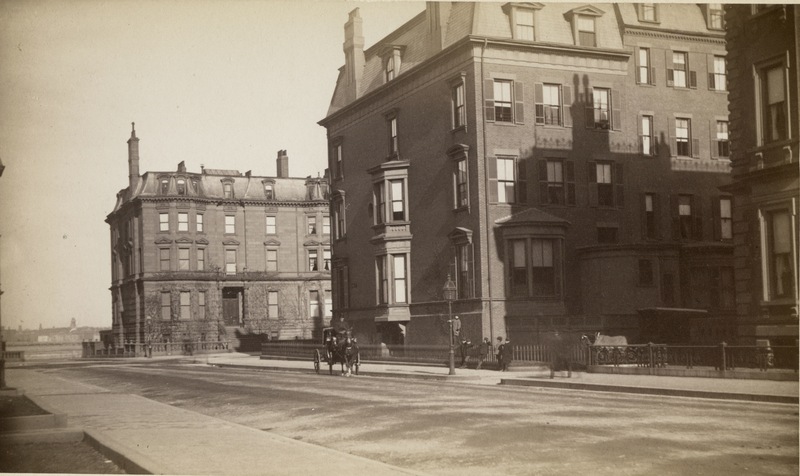 The parcel originally was part of a tract of land that William Goddard and T. Bigelow Lawrence had purchased from the Commonwealth of Massachusetts on August 1, 1857, that included all of the land on the south side Beacon Street from Arlington to Berkeley. Click here for an index to the deeds for 303 Berkeley (147 Beacon). In 1861, 147 Beacon became the home of John L. Gardner’s son, Joseph Peabody Gardner, a shipping merchant, and his wife, Harriet Sears (Amory) Gardner. They had married in November of 1860 and 147 Beacon probably was their first home together. Prior to their marriage, he had lived with his parents at 7 Beacon. Harriet Gardner died in November of 1865. Joseph Gardner continued to live at 147 Beacon until his death in June of 1875. After his death, their three small sons — Joseph Peabody Gardner, Jr., William Amory Gardner, and Augustus Peabody Gardner — lived at 150-152 Beacon with Joseph Gardner’s brother and sister-in-law, John Lowell Gardner, Jr., and Isabella (Stewart) Gardner (their only child, John, III, had died in March of 1865). In November of 1876, 147 Beacon became the home of Joseph P. Gardner’s brother-in-law and sister, attorney Joseph Randolph Coolidge and Julia (Gardner) Coolidge. They previously had lived next door at 145 Beacon. They also maintained a home in Brookline. John L. Gardner died in July of 1884. In his will, he left 147 Beacon to his daughter, Julia (Gardner) Coolidge. In 1884, the Coolidges purchased Hillfields in Chestnut Hill, where they built a new home, completed in August of 1886. The Coolidges continued to live at 147 Beacon during the 1886-1887 winter season, but were in Europe for the next two seasons. During the 1887-1888 winter season, 147 Beacon was the home of Caroline (Sturgis) Tappan, the wife of William Aspinwall Tappan. Her primary residence was at their home, Tanglewood, in Lenox. She had lived at 17 Marlborough during the previous season. Her son-in-law and daughter, Richard Cowell Dixey and Ellen Sturgis (Tappan) Dixey, lived at 179 Commonwealth, and Mrs. Tappan probably was living in Boston because of the birth of their granddaughter, Rosamond Sturgis Dixey, in June of 1887. Caroline Tappan died in October of 1888 in Lenox. Tanglewood was inherited by William and Caroline Tappan’s two daughters: Ellen (Tappan) Dixey and Mary Aspinwall Tappan, who never married. 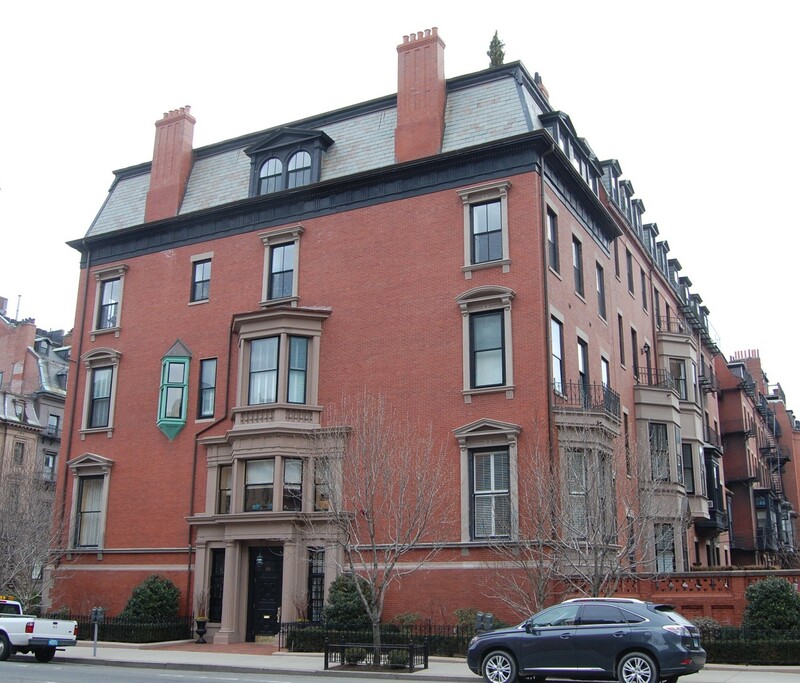 In 1937, Mary Aspinwall Tappan and Rosamond (Dixey) Brooks (who married Gorham Brooks in June of 1913) donated the property to the Boston Symphony. During the 1888-1889 winter season, 147 Beacon was the home of Lawrence Barrett and his wife, Mary F. (Mayer) Barrett. Lawrence Barrett was an internationally-known actor and was performing in a series of plays with Edwin Booth at the Boston Theatre (the previous season, when he performed in a similar series with Booth, the Barretts had lived at 284 Commonwealth). After the season, Lawrence Barrett continued his acting tour and Mary Barrett probably moved to their summer home in Walpole. She was living at the Hotel Vendome during the 1889-1890 winter season (he underwent a serious operation in Boston in December of 1889). By the 1889-1890 winter season, the Coolidges were once again living at 147 Beacon. In her book, Ogden Codman and the Decoration of Houses, Pauline C. Metcalf indicates that, in 1895, the Coolidges retained Ogden Codman, Jr., to provide interior decoration of their Boston home. The Coolidges continued to live at 147 Beacon during the 1902-1903 winter season, after which they moved to 130 Beacon, across the street. 147 Beacon became the home of their son, attorney Harold Jefferson Coolidge, and his wife, Edith (Lawrence) Coolidge, who had married in February of 1903. Prior to their marriage, he had lived at 17 Exeter and she had lived at 59 Commonwealth with her father and step-mother, Amory Appleton Lawrence and Gertrude Major (Rice) Lawrence. In about 1906, they remodeled the house to replace the Beacon Street entrance with a grade-level entrance on the Berkeley Street. From then on, the address was 303 Berkeley. The Coolidges continued to live at 303 Berkeley until his death in July of 1934. They also maintained a home in Prides Crossing. After his death, Edith Coolidge moved to an apartment at 101 Chestnut. In June of 1935, she married again, to James Amory Sullivan, an architect and artist. During the 1934-1935 winter season, 303 Berkeley was the home of Maude Lillian (Dearborn) Guyette Bush, the widow of Frank Edward Guyette and of George N. Bush, and her unmarried children, Charles Nelson Bush and Olive Dearborn Bush. They previously had lived at 83 Westland. She operated 303 Berkeley as a lodging house. By the next season, they had moved to 144 Marlborough. “I had been very busy this autumn moving out of 303 into 101 Chestnut Street, my new apartment. After a two month’s effort to sublet, a proposition to rent the house I had lived in over thirty years came, when I was on the yacht in Newport harbor. I had to decide at once, and empty it all out in two weeks. My answer was ‘Yes,’ though it was a wrench; so the boys worked hard in their spare time, and the deed was done on time. On May 10, 1935, 303 Berkeley was acquired from Edith Coolidge by Euphemia E. McClintock. A native of South Carolina, Euphemia McClintock had served as president of the College for Women in Columbia, South Carolina, until that institution merged with Chicora College in 1915. She moved to Boston, where her sister, Mary Law McClintock, operated Miss McClintock’s School 4 Arlington and (by 1922) at 135 Beacon. Euphemia McClintock probably first was a teacher in her sister’s school, but by late 1923 had established her own institution, Erskine School, at 115 Beacon. Mary Law McClintock died in January of 1925, and Euphemia McClintock appears to have inherited her sister’s school. McClintock School soon ceased operation at 4 Arlington and 135 Beacon became Erskine School. At about the same time, Euphemia McClintock ceased leasing 115 Beacon (which became a private home again) and acquired 111 Beacon. Miss McClintock lived at 129 Beacon, which she had acquired in October of 1919 and also operated as part of Erskine School, either as a dormitory or classrooms (or both). She had acquired 145 Beacon in August of 1928 and had converted it into a dormitory for Erskine School. In July of 1935, having acquired 303 Berkeley, she filed for (and subsequently received) approval to combine the two buildings, cutting through openings in the party wall on several floors. The buildings continued to be used as a dormitory and dining room for residents of the building. By 1937, Erskine School occupied seven buildings on the south side of Beacon between Arlington and Berkeley: 105, 111, 115, 129, 135, and 145 Beacon, and 303 Berkeley (147 Beacon). Euphemia McClintock continued to serve as director of Erskine School until about 1939, and to live at 129 Beacon until about 1940. On November 28, 1941, Anne M. Young and Franklin W. Fessenden, conservators of the property of Euphemia McClintock, transferred the five buildings she owned — 111 Beacon, 129 Beacon, 135 Beacon, 145 Beacon, and 303 Berkeley — to Erskine, Inc.
Erskine School continued to occupy 145 Beacon – 303 Berkeley in 1946, when it suffered a fire sufficiently serious that it required the building to be entirely vacated. On December 29, 1950, 145 Beacon and 303 Berkeley were acquired from Erskine School by Emerson College. The College already owned 126-128-130 Beacon, across the street, and in October of 1956, it acquired 143 Beacon. In 1953, Emerson College opened its Samuel D. Robbins Speech and Hearing Clinic at 145 Beacon. The Clinic remained there until about 1961, when it was moved to 168 Beacon. The College subsequently used the property as a dormitory and for offices and classrooms. 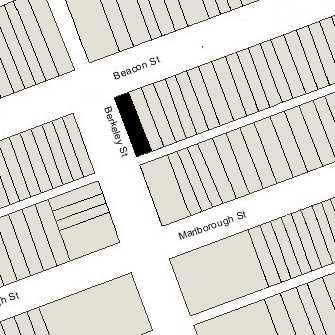 On May 8, 2001, Modern Continental Enterprises purchased 143-145 Beacon and 303 Berkeley from Emerson College. In July of 2000, prior to finalizing its acquisition of the property, Modern Continental Enterprises had filed for (and subsequently received) permission to combine the three buildings into one property, with the address of 303 Berkeley, and to convert them into nine apartments. In September of 2002, it filed for (and subsequently received) permission to combine two of the units and reduced the total number to eight. On February 12, 2003, Modern Continental Enterprises converted the apartments into eight condominium units, The Residences at 303 Berkeley.